Barry's hair has long gone gray, his face lined with deep signs of age. Sitting across from me in his pressed blue shirt, he looks like an uncle, maybe even a grandfather. But Barry's employment file is … not a fun read. He told a coworker she was a "whiner," and his colleagues have filed complaints about his inappropriate remarks six times this year. So as avuncular as he seems, I don't really have any options. I have to fire the guy. "We've addressed the disruptions you've caused with coworkers before," I say, "and this last one is strike three." He immediately becomes flustered, defensive. "Everyone is so—oh, come on," he says, stammering a little. "Everyone is so sensitive. It wasn't like this 10 years ago." A screen appears floating above and to the side of his head, containing three possible things I could say. In each choice, a word or two is bolded, so that the VR software I'm using can identify what I'm saying and trigger Barry's response accordingly. The second sounds wishy-washy ("You know I've always liked you, but I have to follow the rules. I'm really sorry. "), the third sounds bloodless ("As discussed, your actions are disruptive to coworkers. This is the final offense. We are letting you go. "), so I opt for the first. "Times are different now," I say, wincing a little inwardly at how I sound. "We're going to have to let you go." Barry twists in his chair, motioning at the other desks and people outside the door of my office. "I have 20 more years' experience than anyone in there!" he says. "Have you looked at my sales numbers? How do you justify this based on those numbers?" There's nothing I can say that won't make things worse, so I choose neutral compassion: "I understand if you need a moment to process this." His face crumples. He looks down at his hands, then back at me. Is he going to yell? I think. Cry? How do I deal with that? "Y-y-y-ou…Do you…" His voice breaks. He looks around, composes himself. "Take this time to process this," I say again. "I'll go over the next steps when you're ready." Yet, after a few more seconds, Barry seems to turn the corner into acceptance. "Well, I didn't see this coming," he says. "I really thought I was going to finish my career here. Look, I appreciate the opportunity. It was a pleasure working with you." Awkward moments aside, VR's role in the corporate world has far outpaced its consumer impact. But while its applications have largely been clustered around design, collaboration, and even job training simulations, virtual reality has in the past year seen a flurry of activity around so-called soft skills: leadership, communications, HR applications, and other people-focused business fields. Now, Talespin, a company Jackson cofounded, hopes that virtual humans like Barry will allow companies to leverage VR's unique social mojo to make their employees smarter—faster. When Jackson and his cofounder, Stephen Fromkin, started Talespin in 2015, they didn't know exactly where VR was going—they just knew it wouldn't be a consumer technology in the beginning. Both of them had come out of virtual production in the entertainment industry, so were well acquainted with what real-time engines like Unreal and Unity could accomplish. They wound up using that familiarity in 2016 to build a training simulation for Farmers Insurance in which claims adjusters hone their eye for details by walking through a VR house. After word of the Farmers project got around, other companies came calling, but they didn't necessarily want to concentrate on process-based learning like Farmers had. "They kept coming back in conversation after conversation about 'How do you guys see this technology be able to be applied towards soft skills?'" remembers Jackson. There are a lot of answers to that question, but most them involve a computer-generated solution rather than a video one. "Having a conversation with someone that responds to you is key," says Jeremy Bailenson, who runs Stanford's Virtual Human Interactive Lab. "It's hard to have a video respond realistically." So even as far back as the mid-1990s, researchers used virtual humans—known as "agents"—to explore how VR might help curb fear of public speaking. Annie Harper, cofounder of Equal Reality, which creates inclusion and bias recognition training using scanned VR avatars, cites two other reasons that virtual humans emerged as the necessary solution for soft skills. "Embodiment is a major one," she says, referring to VR's ability to make you feel as though you really inhabit the body of your avatar. "Another is simply head-tracking and how it impacts the cochlea; 360-degree video can't track with your head, so it induces seasickness." When Talespin cooked up a virtual-human demo of their own last summer and started showing it to companies, Jackson says, "people went nuts." It was night and day from early VR discussions where companies were interested, but not ready to fully buy the idea it could transform learning. The requests came from every possible department. Can you do it for our leadership program? Can you do it for vendor negotiations? Can you do it for conflict resolution and proper performance reviews? That's where Barry comes in. The experience is meant to demonstrate not just Talespin's prowess on the technology side—marrying AI and design to allow Barry to respond to you as fluidly as possible—but that the company understands the "soft" part of "soft skills." "The fidelity of the character and the emotional realism is a gating factor for doing anything in the space," Jackson says. "So that's really where our focus has been." While it felt insensitive to me in the moment, Talespin developed the demo to adhere to best practices developed by Harvard Business Review, balancing the enormity of the moment with guiding people through a process that's a lot like grief. Talespin isn't alone in that. "It never feels right with role-playing; you know it's a game during your retreat," Bailenson says. So StriVR, a company he works with that established itself by training athletes, has branched into soft skills as well. It recently installed 17,000 headsets in Walmart stores across the country—at least two of them per store—in what Bailenson calls "the biggest rollout we've ever seen in any given application in VR's history." The headsets will be used for a combination of employee evaluation (coping with Black Friday rush or a difficult customer) and leadership training, in which managers will learn how to deal with problematic behavior or how to let an employee go. "The great thing about VR is you can do something that's rare in nature, and give people extra repetitions," Bailenson says. 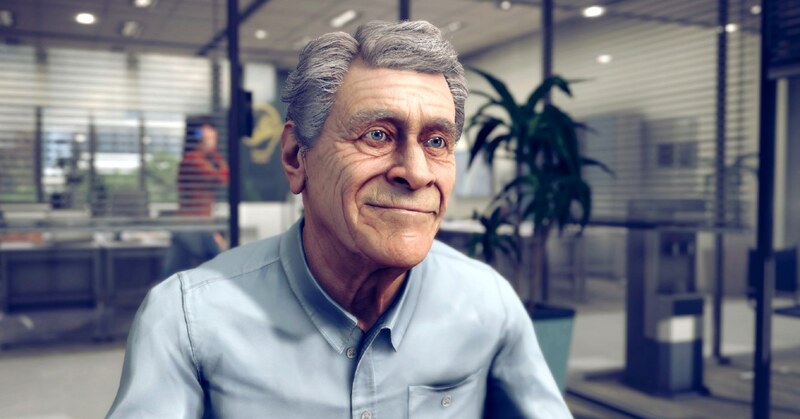 "The cool part of using computer graphics for this, virtual humans, is you can go through as the manager and have this difficult conversation—then you can relive the experience from the point of view of the employee, get to hear your voice coming out of an avatar you've chosen to look like you. Now that you've got this newly emotionally understood information from being on the receiving end of this bad news, you get to repeat it and do it again." If StriVR is stretching wide and scaling fast, Equal Reality is consciously restricting itself on one corner of soft skills. "The reason we've focused on diversity and inclusion is that if you focus on one case use, that defines how your tech is built—and the expectations of your clients around that," says Harper. "We could do any sort of soft-skills training, but by developing a client base that starts there and then works its way out, we're thinking about it as a behavior change technology first." And that behavior change can crop up in surprising ways. "When you go into VR you forget the physical world," Bailenson says. "I've had CEOs of Fortune 100 companies be in front of their entire C-suite in the room—and when they get into a VR conversation with an employee, it's as though no one else is there. One CEO, a tear ran down his face and out of the headset because he had to fire someone." Restoring humanity to bottom-line decisions? It may not change the outcome, but it could make getting there a little less painful for everyone.